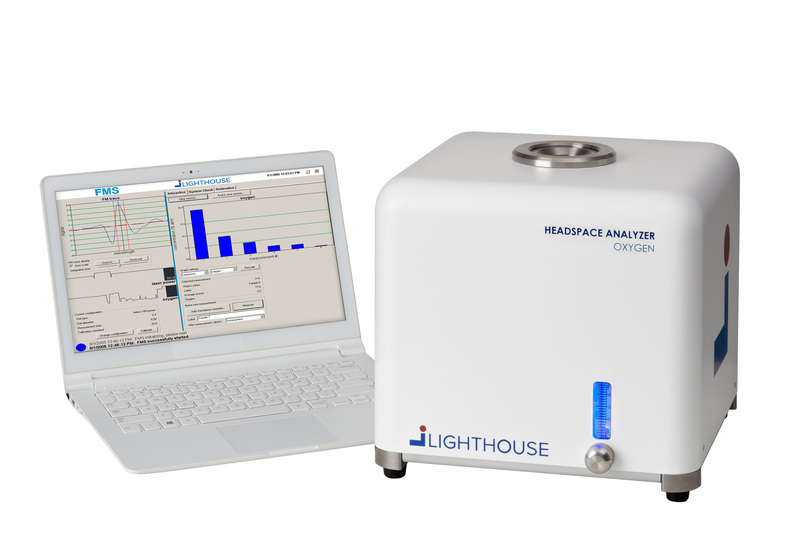 The FMS-Oxygen Headspace Analyzer is a non-destructive gas analyzer for monitoring headspace oxygen concentration in sealed parenteral containers. This compact benchtop instrument utilizes a patented laser absorption technique developed with funding from the Food and Drug Administration. Light from a near-infrared diode laser is tuned to match an internal absorption frequency of the oxygen molecule and passed through the empty container headspace above the product. The amount of laser light absorbed is proportional to the oxygen concentration in the headspace. The measurement method is rapid and non-destructive. These characteristics allow for multiple measurements on the same sample enabling the accurate monitoring of the oxidation of a single sample over time. Because the sample is not destroyed there are no waste disposal issues and potentially valuable product can be saved for other tests. The benchtop headspace oxygen analyzer is used for development and QC laboratory applications as well as for at-line in-process control of headspace oxygen levels in production. Systems can be permanently situated in laboratories for product development, release testing, and QC investigations or mounted on carts and wheeled from line to line for in-process monitoring and troubleshooting activities.